History as a subject for movies intrigues filmmakers. There’s all that opportunity for costumes, scenery, violence and romance. Perhaps most popular are epic war stories and their heroes (Braveheart, Ride with the Devil), but there’s also a subgenre that specializes in royal courts and their intrigues (Elizabeth, Mrs. Brown, Ridicule). Mad Love (a literally accurate retitling that somehow sounds like a cheesy Hollywood romantic comedy) fits squarely in the royal court tradition, focusing on the obsessive passion that Joan of Castile carried for her husband, Philip the Handsome. This Juana (Pilar Lopez de Ayala) was a daughter of Ferdinand and Isabella (Susi Sanchez in a finely etched cameo), the monarchs who reigned over Castile and Aragon in the latter half of the 15th century, well known for financing Christopher Columbus, banishing the Jews, and supporting the Inquisition. Marriages amongst royalty in those days were entirely a matter of political alliances; Juana was betrothed to Philip (Daniele Liotti), who at the time of their marriage was the ruler of Burgundy and Flanders. 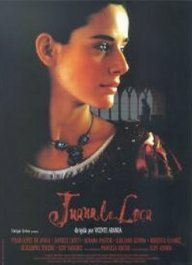 As a result of a series of family deaths, when Queen Isabel herself dies, Juana is heir to the throne of Castile. She and Philip return and she is well received by her subjects. But both her passion and jealousy continue unabated, while Philip and his father-in law, Ferdinand, plot to imprison Juana and take over the throne. Before that is carried out, Philip dies, but, nonetheless Juana (at about 30) ends up confined at the isolated fortress of Tordesillas for the rest of her life. It’s an intriguing and engrossing story and it’s given first class production values in Mad Love. In dark hues, the scenery is almost entirely interiors of royal palaces; the costuming is lavish and elegant. Lopez is extraordinarily beautiful and does all with this script that possibly could be done, portraying Juana’s extremes of emotion with intensity and conviction. Liotti has far less to do, but fulfills the physical requirements of the role appropriately. But Mad Love, for all the skill invested in its production, falls short of great drama. It fills its nearly two hour length with incident, but it fails to illuminate the central character of Juana beyond the central elements of her passion, jealousy, and superstitious/religious beliefs. There isn’t a single scene of her interacting with her children or conducting the business of a monarch. The climactic scene of Juana powerfully confronting Philip’s power grab before the assembly of nobles has far less resonance than it should because it is grounded in a characterization lacking both depth and breadth. This is a portrait painted in too limited a palette; it’s more successful at relating history than in creating an emotionally complex, dramatically satisfying heroine.